4 Things I Learned About Weight Loss From Watching TV! You are here: Home / Weight Loss / 4 Things I Learned About Weight Loss From Watching TV! I have told you How I Lost Over 100 lbs And Kept It Off, and my 5 Secrets To Losing Weight Without Exercise, now I want to share 4 Things I Learned About Weight Loss From Watching TV. I have already shared with you that my weight loss happened mostly while I was recovering from surgery and unable to walk or exercise. Well, I watched a lot of TV during that time and Dr. Oz was a show that was very helpful to me! I really had no idea how to start this journey other than the ideas I learned from the book that I told you about in my post “5 Secrets To Losing Weight Without Exercise”. So, the information I gained each day from the Dr. Oz show really helped me carve a path to my own weight loss plan. 1. Your Waist Size Is More Important Than Your Weight. Dr. Oz said that your waist should be no more than 1/2 your height in inches, and my Dr. agreed. He said that you see people who are large on top or bottom but have tiny waists, and that they are at less risk of weight related issues than those who have larger waists. So, if you are 5’5”, that would make you 65” tall, and your waist should be no larger than 32.5”. When I was in bed after my surgery, trying to lose the weight, my daughter and son in law were visiting and he is a fantastic cook! One night I was in bed and I smelled something he was cooking and I said to myself “that smells so good, I am so hungry!”. Right then, I stopped and thought about it, and realized I wasn’t hungry at all! I had eaten already and was comfortably full, but my nose smelled something good and that told my brain I was hungry! Think about it, how many times have you passed a bakery or coffee shop and smelled the bread or coffee and thought “Oh, I need coffee” or “Oh, I am so hungry!”? So, remember next time to stop yourself and really examine if you are hungry or not. Dr. Oz also said the entire obesity epidemic is about eating or drinking 100 calories a day too many. Can you believe that just 100 calories a day can make that big a difference? That’s like 1 soda a day. Belly fat is called Omentum and it squeezes your kidneys and that causes high blood pressure, it poisons your liver and causes high cholesterol, it also blocks insulin causing diabetes. All of that is caused by belly fat! When your belly is too fat, the omentum presses on your organs and makes it difficult for them to do their job. This goes back to the waist size too, I think. It all made sense once Dr. Oz explained the omentum and the pressing it does on your organs and the health problems it causes. 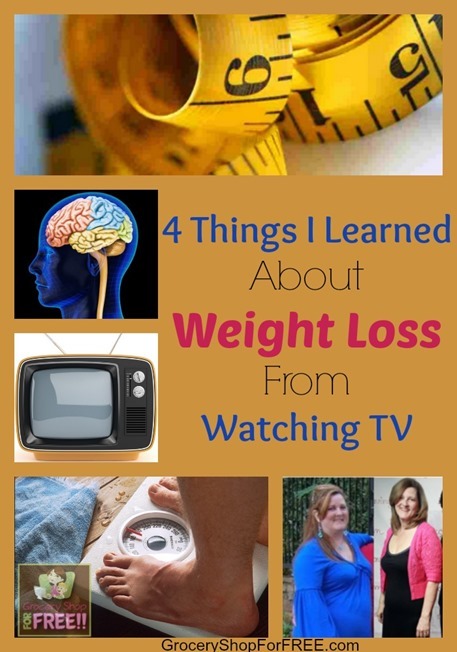 Those are 4 Things I Learned About Weight Loss From Watching TV. There are many more things I have learned on this journey and I will share those more later. These are a few things that might help you get started or stay motivated, give you a direction or goal. Quisiera saber como puedo perder peso porque me esta afectando mucho. a mi también. Usted puede leer toda mi sección de pérdida de peso: http://www.groceryshopforfree.com/category/weight-loss-2/ . Espero que ayude!